Magnum Research, Inc, maker of the world-renowned Desert Eagle pistol and leader in innovative firearms design and manufacturing, is proud to announce the launch of the new 429 DE pistol cartridge. Magnum Research has developed a new, fast, powerful .44 caliber pistol cartridge. 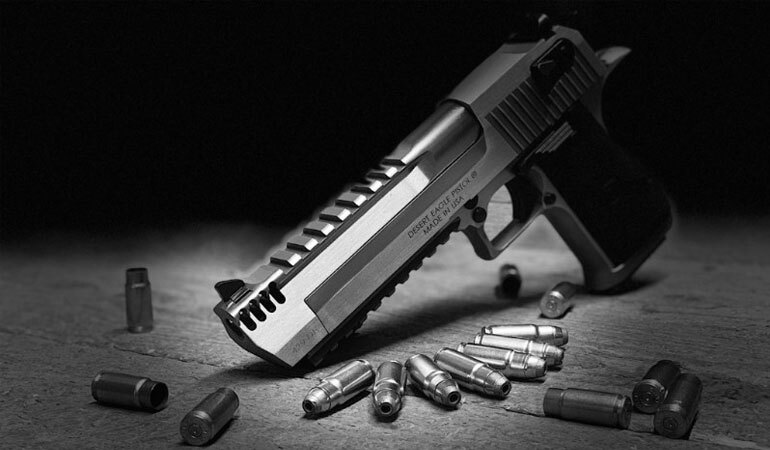 The 429 DE (Desert Eagle) was designed to enhance the famous and powerful Desert Eagle platform. This cartridge has a 25% velocity increase and 45% energy increase over a 44 Mag (240 -- 6" barrel). It has a velocity of 1600 FPS with 240 grain bullets and 1750 FPS with 210 grain bullets. The 429 DE features 30 degree shoulder headspaces and a neck long enough to properly hold and crimp a 240 grain bullet without set back under recoil. Based on the famous 50 AE cartridge, the 429 DE is made with Starline brass, and loaded by HSM in Montana with Sierra bullets. "This new cartridge was engineered and designed specifically for the Desert Eagle Pistol, keeping in mind that the DEP is known world wide for its awesome firepower and performance. The 429 DE propels that history into the future," says Jim Tertin, Design and R&D for Magnum Research. The 429 DE rounds are available in boxes of twenty and distributed by Magnum Research, Inc. Available options include: 240 grain soft point (DEP429DE240JSP) MSRP of $42, and 210 grain hollow point (DEP429DE210JHP) MSRP of $42. To accompany the 429 DE cartridge, Magnum Research will soon be releasing a lineup of 429 DE 6-inch barrels in a variety of finishes. The 429 DE barrels will be compatible with any MK19 USA or Israel Desert Eagle Pistol with a wide .830” rail on top of the barrel and uses a 50AE magazine and bolt. More information on these barrels will be announced soon. Note: The 429 DE is similar to, but NOT INTERCHANGABLE with, the obsolete 440 COR BON, but properly engineered with a sharp 30-degree shoulder, consistent headspace and reliable function and velocity. For more information about Kahr Firearms Group products visit www.kahr.com, www.magnumresearch.com, www.autoordnance.com or www.customdeserteagle.com. For press inquires, contact Monica Arnold atpr@blueaugust.com.